This is the perfect round for IDPA SSR. I know that’s a bold statement, but if you’re not going to handload for IDPA SSR, you need a bullet that does three things: works with a lightened action, is easy to reload, and makes power factor. The 130 grain FMJ load from Federal does all three of those things. Let’s start with the most important thing your IDPA Stock Service Revolver ammo should do: make power factor. In IDPA, the PF for SSR is set at 105,000, which we’ll shorten to just 105. For those not familiar with the shooting sports, the formula for power factor is bullet weight times velocity, then divided by 1000 to make a three digit number. So for example, a bullet that weighs 130 grains would need to be going at least 807.7 FPS to make power factor. Weather affects bullet velocity, on a cold day the air is more dense making your rounds slower. Hot days are good for chrono checks; unfortunately when my rounds were chrono’d at the IDPA Nationals, it was about 40 degrees. Three rounds are shot over the chrono, and the American Eagle produced an 820, 820, and 817. That’s…pretty consistent, actually. And what I’ve come to expect from Federal’s products. That put my power factor at a comfortable 106.5, giving me plenty of confidence in using these rounds again. The next thing that your rounds need to do, and honestly it could be argued that this should have been the first thing, is work. Revolver shooters love to lighten the trigger pulls on their guns. Most wheelguns come with barely shootable 334 pound trigger pulls from the factory, but some judicious tuning can get a good wheelgun like a S&W or Ruger down to the 8 pound range easily. A really good gunsmith can get S&W wheelguns lower than that, even. But all this lightening comes at a cost, and that cost is reliability. A lighter trigger pull transfers less energy to the primer, which means your chances of a click instead of a bang go up. There are some gear solutions, like using extending firing pins on S&W revolvers, but the most common solution is “use federal primers.” Federal primers are the softest on the market, meaning they require the least amount of energy to detonate. 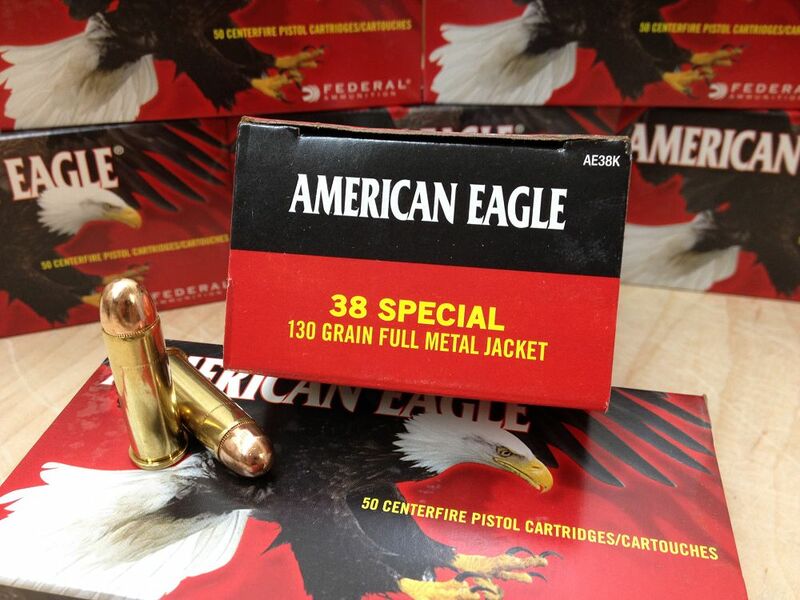 Hey, guess what primers this ammo has in it? Finally, there’s ease of reloading. No joke, reloading one of these ancient spinny-middle guns isn’t easy. It’s not like reloading a semi-auto pistol, where you only have to stick one thing in one hole (hur hur). No, reloading a wheelgun means you have to simultaneously stick it in six holes. If you’re off by a little bit, you crash into the metal inbetween the charge holes, and can really hang up your load. That’s where two things are important: chamfered cylinders and round bullet profile. Chamfered charge holes mean there’s a slight bevel on the edge of the cylinder’s holes to help catch the tip of the round and guide it in. Bullet profile is important because the perfectly round nose of the Federal 130s is going to be less likely to catch on anything. Unlike flat nose or JHP rounds, it just slides right in. It’s also better than lead because I’ve seen soft lead bullets catch and leave wee little bits of themselves on the shoulder of the charge hole if it’s sharp enough. So there you have it. 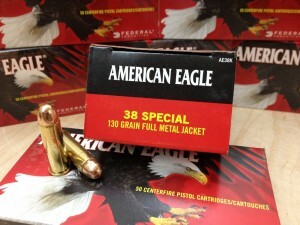 If you’re looking to shoot IDPA SSR and you need off the shelf ammo, get Federal American Eagle 130 grain FMJ. The product code is AE38K. At the typical distance between muzzle and chronograph screens, I don’t believe variations in ambient temperature and air density are going to make enough difference to measure. What makes the difference is the temperature of the cartridges themselves, or more accurately the temperature within each cartridge when it is fired. You can check this by clocking loads on a hot day. Fire a few which are the same temp as the air and then a few more which have been in an ice chest with your lunch and drinks. You nailed it. I champhered the ejector plate on my S & W Mod .1955. Target in .45 acp and ground off the little dimple behind the cyclinder for clearance. Replaced front sight with ivory shotgun bead sight. Screwes into threaded hole in end of barrell. I have diff. colors for diff. lighting conditions, I. E. orange, green, yellow, and, of course, white. Bobbed the target hammer and added steel weight on back for positive ignition of primers.